The smallest cactus of all is called Blossfeldia liliputana. Its tiny heads may be only 12-16mm across – that's probably no bigger than your fingertip. 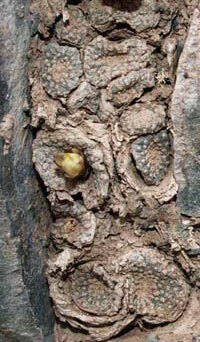 In the wild it always grows in vertical cracks or crevices in the rocks, where it is sheltered from too much sun. Much of the plant is out of sight as it grows a large root, from which the heads sprout. See how many heads you can spot in the picture on the right. Here's a clue – one of them is just coming into flower. Turbinicarpus is a long name for a group of small plants. 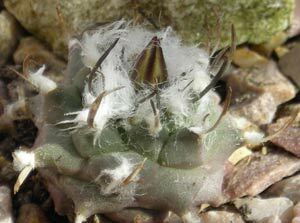 Like other small growing cacti they often grow in rock crevices or among other vegetation which protects them from too much sun. This plant is about 2cms across, and will grow to no more than 3-4 cms. This is a type of Echinocereus. 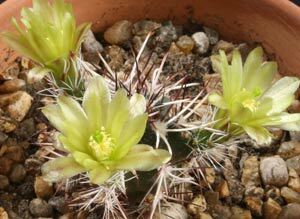 Many Echinocereus grow into large plants but this one remains very small. In the wild it grows in rock crevices together with a particular type of fern. The fern protects it from sun and from being eaten. It is one of only a very few cacti to have green flowers. The plant shown is about 2cms across, and will never get much bigger. As you can see it has plenty of flowers for such a small plant.